A groundbreaking study of Wisconsin State Public Defender attorneys examines the effects of "compassion fatigue" – the cumulative physical, emotional, and psychological effects resulting from continual exposure to others' traumatic experiences. This article discusses factors contributing to the risk any lawyer may face of experiencing its symptoms, and what can be done to mitigate it. Ben Gonring spends his days representing 10 to 17 year olds who are in trouble with the law. After 15 years in the juvenile unit of the Wisconsin State Public Defender (SPD) Office in Madison, he says the best part of his job is getting to know his young clients well, so he can be an effective advocate for them in court. But gaining that knowledge also has a dark side. Judy Schwaemle retired from the Dane County District Attorney’s Office last year after 27 years. Many times in her career, she saw horrifying evidence of what one human did to another. Those disturbing images often lingered and intruded into her thoughts away from work. Even now that she’s retired, memories remain. Experiences such as these can take a toll on lawyers. Recently, the State Bar of Wisconsin undertook a study to learn just how significant that toll is and what can be done to mitigate it. The study examined the prevalence of what’s known as “compassion fatigue” – that is, the cumulative physical, emotional, and psychological effects of continual exposure to traumatic stories or events when working in a helping capacity. The study found that SPD attorneys reported significantly higher levels of compassion fatigue than administrative support staff and the general population, when data for the latter were available for comparison. The study’s findings break down by specific symptoms of compassion fatigue as follows. “A major finding of our study,” Dr. Andrew Levin reports, “is that the extent of caseload and lawyers’ exposure to other people’s trauma were clearly related to symptoms of compassion fatigue.” Interestingly, factors such as years on the job, age, office size, gender, and personal history of trauma made no significant differences in compassion fatigue levels. Are we to conclude from the key findings that SPD attorneys are impaired on the job? Absolutely not, says Dr. Andrew Levin, medical director at the Westchester Jewish Community Center in Hartsdale, N.Y., and cofacilitator of the study. Bear in mind, he emphasizes, these results come from self-reporting instruments, which indicate trends, not diagnoses of conditions. In psychological language, exposure to another person’s trauma is referred to as secondary trauma. “There’s research on the impact of secondary trauma on human beings, but it’s never been looked at extensively with lawyers. We’re on the forefront of this,” says Linda Albert, coordinator of the State Bar’s Wisconsin Lawyers Assistance Program (WisLAP) and cofacilitator of the compassion fatigue study. As WisLAP coordinator, Albert has given presentations about compassion fatigue to many groups of legal professionals in recent years. She’s seen the topic hit home again and again with various audiences. “I’ve done this with bankruptcy lawyers, guardians ad litem, public defenders, prosecutors, judges, court commissioners. … Every time it’s resonated,” she says. 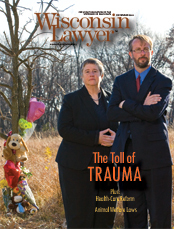 Levin and Albert learned of their mutual interest in the topic of compassion fatigue and decided to do a formal study of its effects on Wisconsin attorneys. They decided to focus on one specific group: state public defenders. To learn more about such effects, study questionnaires went out to a total of 474 SPD attorneys and administrative support staff. Response rates for completed surveys were remarkable: 78 percent of attorneys and 65 percent of support staff. Count judges among those affected by compassion fatigue, as well. Neal Nielsen, an eight-year veteran on the circuit court bench in Vilas County, says judges’ exposure to trauma differs from lawyers’. “Attorneys are much more closely related to the facts of the case for a much longer period of time than are judges,” he notes. Still, judges sit on the bench hearing, day in and day out, about a procession of incidents of trauma inflicted or endured by people in their courtrooms. “And I can sit here now and call up in my mind with great accuracy all the autopsy photos I’ve ever seen,” Nielsen says. As a supervisor, she knows young SPD lawyers must learn to put up protective boundaries, to keep their emotions in check. “The older attorneys get good at that,” she observes, “but then when they go home, they have trouble lifting those boundaries” with families and friends. Robert Kaiser also has seen “inexplicably, indescribably horrible evidence” in his 34 years as a district attorney, the last 24 of those in Dane County and the remainder in Chicago. He never wanted to be anything but a district attorney, and he knew exposure to trauma would be part of the job. The combination of burgeoning caseloads and shrinking budgets makes it increasingly difficult for district attorneys to fulfill their duty to protect the public, Kaiser notes. In his eyes, lack of support sends a message that crime victims and the district attorneys’ work don’t matter. Public defenders, too, are hurt by budget cuts. And they’re targets of public scorn for simply doing their job: defending people’s constitutional rights. Thus, heavy caseload and exposure to trauma aren’t the only factors fueling compassion fatigue in attorneys. In the State Bar’s study, SPD participants wrote in comments about additional contributing factors. The top three were lack of respect, lack of control in one’s work life, and lack of enough time to process issues and give or get support. In this video, Deb Smith, SPD director of assigned counsel, and Linda Albert, State Bar WisLAP coordinator, discuss a groundbreaking study of State Public Defender attorneys. This study examines the impact of secondary trauma on lawyers who are continually exposed to others' traumatic experiences. The results of the study, the first of its kind, appear in the December issue of the Journal of Nervous and Mental Disease and will draw wider attention to the topic of attorneys’ compassion fatigue. Albert already has spoken about it at a Canadian conference and for the national conference of the American Bar Association’s Commission on Lawyer Assistance Programs. In addition, Albert is working with the SPD to develop strategies that both individual attorneys and the agency can use to minimize work-related stress. She anticipates adapting these strategies for use by lawyers in other practice areas. The State Bar is one of several bar associations participating in a second study that seeks information on factors, personal and professional, that contribute to life and career satisfaction or dissatisfaction. The study, to be conducted in May 2012, is headed by Dr. Kennon Sheldon, University of Missouri, Department of Psychology, and Prof. Lawrence Krieger, Florida State University College of Law. “WisLAP will use the data to develop ways to prevent and mitigate professionalism, ethics, and mental health and substance abuse problems within the profession,” Albert says. Debrief. Talk with another lawyer who understands what you’re going through and can offer support. Debriefing can become a part of the office culture. Remember, this is a discussion about how the case is affecting you as a person, not a rehashing of legal strategies. Take care of yourself. Eat healthy foods. Exercise regularly. Get enough sleep. Learn relaxation techniques so you can let go of stress and disturbing, repetitive thoughts. Know what truly brings you joy in life and make time for it. Strive for balance and interconnection. Give up the urge to be all things to all people, including clients. Allow time to connect with friends and family to counter-balance the stresses you feel at work and put everything back in perspective. Come up with a plan. When compassion fatigue is weighing on you, it can be difficult to get off the treadmill and set a new course. Stop long enough to notice how you’re feeling, reacting, and behaving at work and at home. Develop a plan of action for yourself. What needs to change? Where can you start? Seek help. If you think compassion fatigue is interfering with your work or personal life, reach out for help. A good place to start is WisLAP. Call the 24-hour helpline, at (800) 543-2625, or coordinator Linda Albert at (800) 444-9404, ext. 6172. All inquiries are confidential.